The Superfund Group of investment companies launched its first fund in March 1996. Superfund's trend-following trading strategy is based on 20 years of strong research and development of technical trading systems that capture over 120 liquid financial and commodity markets worldwide. Superfund is a systematic investment manager that uses fully-automated technical trading systems to remove human emotions from trading decisions. Representing the future of investing, these technical trading systems are based on statistical analysis and mathematical modeling of historic data, with the goal to deliver absolute returns in bull and bear markets. Superfund Group manages funds for retail and institutional investors world wide and is serving clients and partners through its offices in the United States, Europe and Asia. First retail managed futures fund, Superfund-QAG, was launched. Superfund launches its first Luxembourg SICAV fund. Superfund office was opened in Zurich, Switzerland. Superfund Green, L.P. launched in the United States. First TV commercials in the U.S. for a managed futures fund. Superfund opens the first hedge fund walk in center in Europe. The Superfund Fifth Avenue Investment Center opened in New York. First Superfund public offering in Japan. Superfund Gold, L.P., the first retail gold-denominated managed futures fund offered in the U.S..
First retail silver-denominated fund launched in Europe. Superfund starts to market its first U.S. mutual fund. Managed futures funds are a particularly interesting investment strategy because historically they have offered a significant degree of downside protection, especially in declining equity markets. With a historically low or even zero-correlation with stocks, one of the most attractive features of managed futures is their ability to add broad diversification to an overall investment portfolio. Managed futures funds primarily use standardized futures contracts that trade on highly liquid and strictly regulated futures exchanges worldwide to implement their investment strategies. Managed futures funds seek absolute returns by taking long and short positions in futures contracts. Unlike some managed futures strategies, which allow for discretion in their trades, the Superfund Managed Futures Strategy Fund uses a highly sophisticated, disciplined, and automated trend following system. Managed futures funds have the potential to profit from rising (long) and from falling (short) markets. Timeframe: 01/1980 09/2015; Source: TeleTrader; 1) CISDM CTA Equal Weighted Index: An index of approximately 300 commodity trading advisers that voluntarily report their performance to the CISDM; 2) MSCI World Index: A market-capitalization-weighted equity index composed of approximately 1,000 companies in 20 developed countries 3) Barclays US Aggregate Bond Index: The index measures the performance of the U.S. investment grade bond market securities, all with maturities of more than 1 year. This chart represents the longest common period for the three indices represented. Results over different time periods may vary. Investments cannot be made in an index. The indices used do not reflect any fees, expenses or sales charges. In addition past performance is no guarantee of future results. Index performance is not indicative of the performance of the Superfund Managed Futures Strategy Fund. Investors are drawn to managed futures because historically they’ve shown a low correlation to other major asset classes. As an example, the chart below compares performance of the S&P 500 and CISDM CTA Equal Weighted Index from 01/01/1980 through 09/30/2015. Timeframe: 01/1980 09/2015; Source: TeleTrader; 1) CISDM CTA Equal Weighted Index: An index of approximately 300 commodity trading advisers that voluntarily report their performance to the CISDM; 2) S&P 500: A benchmark of U.S. common stock performance. It includes 500 of the largest stocks (by market value) listed in the U.S. This time frame was chosen to show the long term performance of managed futures as represented by the CISDM CTA Equal Weighted Index. Managed futures also have the potential to limit drawdowns the reduction an investment may periodically experience. 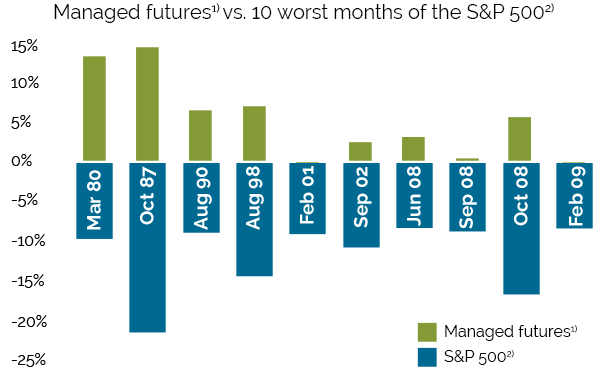 Historically, the severity and duration of the draw downs for managed futures has been less than other major indices. Timeframe: 01/1980 09/2015; Source: TeleTrader; 1) CISDM CTA Equal Weighted Index: An index of approximately 300 commodity trading advisers that voluntarily report their performance to the CISDM; 2) S&P 500: A benchmark of U.S. common stock performance. It includes 500 of the largest stocks (by market value) listed in the U.S. It is considered to be the most important benchmark for market developments in the U.S. This chart represents the longest common period for the two indices represented. Results over different time periods may vary. Investments cannot be made in an index. 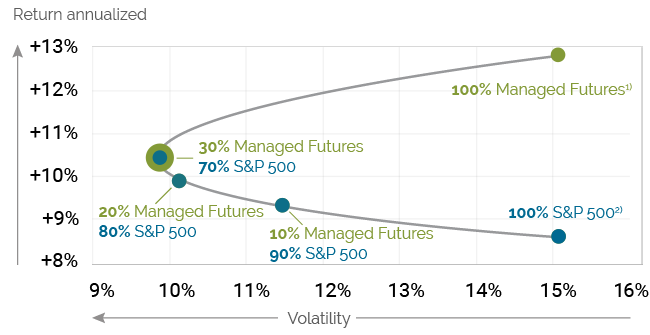 Managed futures have been used to enhance investment portfolios by reducing volatility and improving the risk-adjusted returns over time. As a simple example, this graph illustrates what different combinations of the S&P 500 and CISDM CTA Equal Weighted Index have done from 1/1980-9/2015. This chart represents the longest common period for the indices represented. Results for different timeframes may vary. Investments cannot be made in an index. that offer attractive investment opportunities. Superfund use a proprietary algorithm that has been refined over the last 20 years to initiate positions. This disciplined and technical approach to investing effectively eliminates emotional miscalculations periodically seen with other investment strategies. We don't project the future outcome of an investment. Instead, we focus on detecting clearly defined investment trends over the short, medium and long term horizons and take advantage of them. Once defined, the funds follow a trend until the risk management system tells otherwise. In this way, the Superfund trading strategy seeks to optimize winning trades. At a glance 120 markets seem diversified, yet different investments often act the same. Fundamental to our strategy is ensuring that there is a low correlation amongst portfolio holdings. This ensures the portfolio is properly diversified, enabling us to weather different market conditions. Diversification does not ensure a profit, or protect against loss. Consistent risk management represents the most important element of the trading strategy. The proprietary Superfund trading systems constantly monitor all risk factors and electronically initiate buy and sell orders based on technical analysis. In the event of a major trend reversal due to new factors in the market, the program adjusts to the new environment. In this manner, the systems aim to minimize losses and increase profit potential. Investors should carefully consider the investment objectives, risks, charges and expenses of the Superfund Managed Futures Strategy Fund. This and other important information about the Fund is contained in the prospectus, which can be obtained by calling 855-61-SUPER. The prospectus should be read carefully before investing. 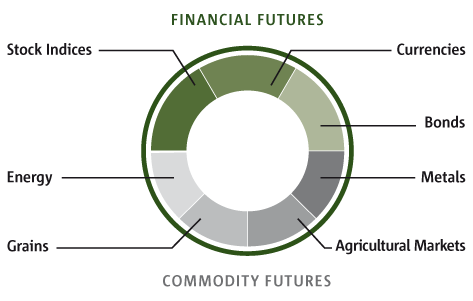 The Superfund Managed Futures Strategy Fund is distributed by Northern Lights Distributors, LLC, member FINRA/SIPC. Superfund is not affiliated with Northern Lights Distributors, LLC. Mutual Funds involve risk and the possible loss of principal. The risks of investing in asset-backed securities include prepayment, extension, interest rate, market and management risk. The value of fixed income securities or derivatives will fluctuate with changes in interest rates. Typically, a risk in interest rates causes a decline in the value of fixed income securities or derivatives. Additionally, the Fund could lose money if the issue or guarantor of fixed income security is unwilling or unable to make timely payments to meets its contractual obligations. Treasury obligations may differ in their interest rates, maturities, times of issuance and other characteristics. No assurance can be given that the U.S. Government will provide financial supports to its agencies and authorities. The value of these securities may be affected by changes in the credit rating of the U.S. Government. The Fund may invest in derivatives including futures, forwards, options, swaps, including total return swaps, repurchase agreements and other similar instruments that may be more volatile than other investments. Risks include liquidity, interest rate, market, credit and management risks, mispricing and improper valuation. Successful use of forward and futures contracts draws on the Adviser’s skill and experience with respect to such instruments. They are subject to imperfect market value correlation, possible lack of liquidity, unanticipated market movements, and counterparty default. Exposure to commodities may be subject to greater volatility than traditional securities as they are subject to market movements, commodity index volatility, and interest rate changes. Their values could be effected by conditions such as drought, floods, weather, livestock disease, embargos, tariffs, economic, political and regulatory developments. Prices of energy, industrial metals, precious metals, agriculture and livestock can fluctuate due to changes in value, supply, demand, and governmental regulation. The stability and liquidity of many derivative transactions depends largely on the creditworthiness of the parties to the transactions. 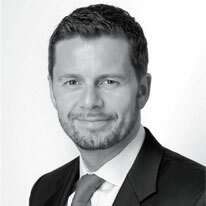 Counterparties could default, exercise contractual rights or become the subject of insolvency proceedings which could involve delays or costs for the Fund. Derivatives linked to index performance will be subject to risks associated with changes in that index. The use of leverage, such as that embedded in derivatives, will magnify the Fund’s gains or losses. Short-term trading and higher portfolio turnover may result in higher brokerage fees, commissions, and tax liability to shareholders. Liquidity risk exists when an investment would be difficult to purchase or sell, possibly preventing the Fund from selling such illiquid securities at an advantageous time, price, or requiring the Fund to dispose of other investments at unfavorable times or prices in order to satisfy its obligations. The Fund will use model-based strategies that, while historically effective, may not be successful on an ongoing basis or could contain unknown errors and inaccuracies. The Fund is ‘non-diversified’ and may invest in a small number of companies or instruments, as a result, a change in value of a single security could significantly effect the Fund’s value. Changes in the laws or regulations of the U.S. or other countries, including any changes to applicable tax laws, could impair the ability of the Fund to achieve its investment objective and could increase Fund operating expenses. The Fund may engage in short selling, which carries the potential risk of unlimited losses. By investing in the Subsidiary, the Fund is indirectly exposed to the risks associated with its investments. The Subsidiary is not registered under the 1940 Act and changes in the laws of the U.S. and/or the Cayman Islands could adversely affect the Fund. The federal income tax treatment of the complex securities in which the Fund may invest may not be clear or may be subject to recharacterization by the IRA, making it more difficult for the Fund to comply with the tax requirements applicable to regulated investment companies. The Fund’s hedging strategy will be subject to the Adviser’s ability to continually and efficiently recalculate, readjust, and execute hedges and the their ability to correctly assess the correlation between the hedging instruments and the portfolio investments. Foreign (non-U.S.) and emerging market, foreign currencies and sovereign debt securities present greater investment risks than investing in the securities of U.S. issuers and may experience more rapid and extreme changes in value due to less information about foreign companies in the form of reports and ratings, different accounting, auditing and financial reporting requirements, smaller markets, nationalization, expropriation, confiscatory taxation, currency blockage, political changes, and liquidity issues. The maximum sales charge (load) for Class A is 5.75%. Total annual operating expenses are 3.36% and 3.11% for the Class A and I shares respectively. The performance data quoted here represents past performance. Current performance may be lower or higher than the performance data quoted above. Investment return and principal value will fluctuate, so that shares, when redeemed, may be worth more or less than their original cost. Past performance is no guarantee of future results. For performance information current to the most recent month-end, please call toll-free at 855-61-SUPER.